INTRODUCTION: This is a book that came out of nowhere - basically I got interested as it has the same title with the huge Miles Cameron debut as it was pointed to me on Goodreads - so I checked the sample and it was compelling, so much so that I had to read the novel next. Two people will stand against mortal and demonic enemies: Alyda Stenna, Captain of the Hammer of Antia returns from campaign to a hero’s welcome after prosecuting war abroad with brutal efficiency.Garian Tain, the spymaster’s apprentice, hunts for an assassin through the streets of the capital while the knights bask in the adoration of the crowds. This is just the beginning.Both will fight overwhelming odds in a bid to save the kingdom. War and betrayal will test them to their limits. One will rise; one will fall; both will be changed forever." 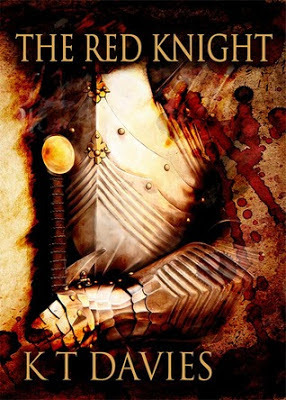 OVERVIEW/ANALYSIS: In describing "The Red Knight", I would say that the narrative pull is extremely high, the main characters impressive in so far they are larger than life heroic and competent but brought down - though of course not for long - by schemers, meddlers and authorial intent that made kings and councilors act extremely stupid, the world building not yet at the A level of recent debuts like Mage's Blood or Blood Song and the storyline is soap opera with knights, sorcery, treason and blood. Villains are cartoonish and there are all the flourishes one expects in soap opera. It wasn’t often that Alyda was mistaken for a noblewoman and as amusing as flirting with the gentleman was, she really should introduce herself. Of course, she knew from past experience that as soon as she did, his attitude would change. He’d either run a mile, challenge her to an arm wrestling contest, or want to talk about the war in Suvia, which was a pity in this case. He was good looking—tall, sandy haired, a bit soft round the middle, but nothing that a little exercise wouldn’t sort out and she knew precisely the kind of exercise she’d like to put him to. This being said the power of the narrative and the compelling main characters - Alyda, the title character, Prince Talin, the love interest of above and Garian the do-gooder spy carry the day and I am definitely interested in more. There are battles galore, intrigue, personal combat, magic, desperate sieges, mistaken identities, despair and hope and all the ingredients that make adventure sff compelling even if occasionally over-the-top. Thorgulsen thought Jerim’s plan was a sack of s**t. It didn’t say much for Telvier’s skill as a strategist if he couldn’t see that. I still have a feeling that as sf this would have worked somewhat better since there one can get away with much more campiness so to speak, but high class fantasy needs high class world building and a storyline that does not depend on the stupidity of the movers and shakers to make sense, so this series is not yet there but the author's narrative power should get it to the top with time. The King leapt to his feet, fists clenched. “How dare you question me? If I choose to give my brother the benefit of my patience, it is none of your concern!”"
Overall K.T. Davies' The Red Knight is a very compelling fantasy soap opera with knights, blood and sorcery and a highly recommended series debut. I am in the series for the duration with very high hopes considering the narrative power of the author. hehehe...when i read the title i thought - "finally,Liviu managed to finish the review,but this is a different book with the same title ,looking forward to your review of the 'other' Red Knight lol. ""The Red Knight" by K.T. Davies ),will be buying the kindle edition and reading it soon. no worries,hope you are feeling better now.